No two pieces of diamond jewelry are identical – as are no two clients. Rather than being part of an automated system where a buyer simply looks up the market value on the largest diamond and gives you a standard quote, we tailor your quote to fit your diamond jewelry as well as your needs. Even if it is a loose diamond, we can still provide more than one option. 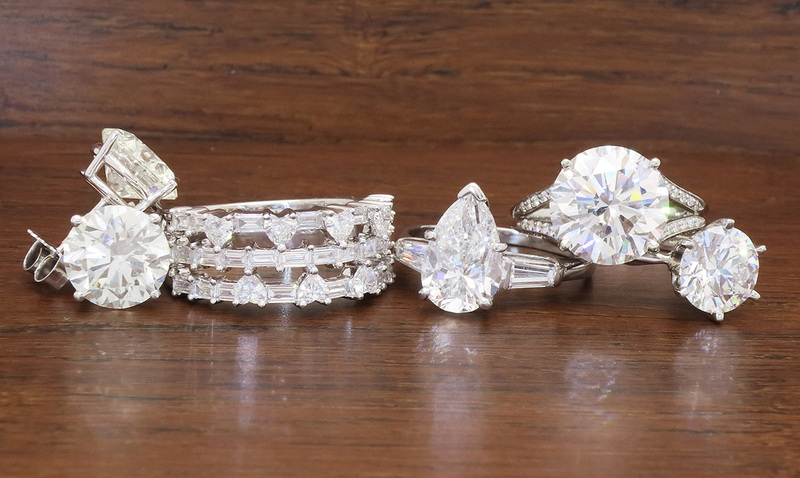 Whether it is a cash offer, our diamond auctions, brokering the piece, or our consignment platform, we work with you to find the option that fits best for you without any obligation for you to sell. Our global Diamond Auctions reach thousands of pre-approved buyers allowing our client’s to have maximum exposure to buyers within a short amount of time. Our Consignment Platform is extraordinarily different than consigning your jewelry with a local jeweler. Our exclusive global platform allows for us to maximize the value we can pull out of your diamond jewelry by keeping it as a finished, wearable, piece of jewelry. Our Broker service utilizes our extensive international relationships with jewelry stores, collectors, and exclusive private buyers to yield the highest amount in the shortest amount of time for our clients. All buyers claim to give the highest cash offer. However, our unique ability to move finished jewelry to a variety of global outlets allows us to price your diamond jewelry accordingly rather than just give an offer based on “scrap” value or the value of the diamonds alone. The sale of a piece of diamond jewelry is an intimate process, and we are honored to walk through the process with you rather than just have you be another nameless piece of jewelry coming through our hands. So, when you’re ready, give us a call or submit a Request for a Quote. You can also learn more about Our Process Here. What an incredibly pleasant experience, in an otherwise heartbreaking circumstance. I was looking for possibilities to sell an engagement/wedding band set, in addition to some other jewelry, that was going to be so difficult to sell online. Matt was unbelievably kind and helpful, and I know they deal in much higher-quality jewelry. I never once felt like I wasn’t just as important as another potential customer/client. He was so quick to respond to every question, went through a myriad of options with me, and never once pressured me to do business with him. When it comes to customer service, quality assurance, and best practices, this is an exemplary business. Check to make sure the company you are working with is not going to remove your diamond without your knowledge.